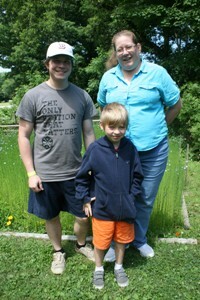 Kimberly Suci (back, right) crafted her own Endless Mountains adventure as a contest winner with the Endless Mountains Visitors Bureau, bringing her son, Kristaffer DeHon (back, left), and grandson, Elijah DeHon, to the area recently for a three days of fun, fine dining, and site seeing. A New York state woman who was the winner of a promotion conducted by the Endless Mountains Visitors Bureau (EMVB) on Facebook in the spring recently fulfilled her fantasy weekend with her family in the Endless Mountains. Kimberly Suci, her son, Kristaffer DeHon, and his son, Elijah, spent three days in the area. They learned how to make cheese, paddled down the Susquehanna River in kayaks, sampled some beer and wine, spotted bald eagles along the river, visited an alpaca farm and a butterfly garden, and stayed at a recently renovated hotel. Followers of EMVB’s Facebook page entered the Create Your Own Adventure sweepstakes contest in March and April, and Kimberly was chosen at random as the winner of the contest on April 17. She was encouraged to develop her own itinerary of activities and venues based on information available in EMVB’s 2014 Calendar of Events and website, www.endlessmountains.org. Kimberly’s family visited from July 11 to 13, staying at the Hotel Harrington in Dushore, Sullivan County, and eating dinners at The Strawberry at Berry Fields Farms near Millview, the Crestmont Inn in Eagles Mere, and Twigs Cafe in Tunkhannock. Upon their arrival on Friday morning, the family visited the Home Textile Tool Museum in Orwell, Bradford County, where they participated in a cheese-making workshop. The drive from Rochester, NY, was a little quicker than anticipated, which gave them some time to explore some country roads prior to the program. Kimberly chose the Textile Museum because she loves cheese and thought that the workshop was a well-grounded, traditional way to begin their adventure. The instructor provided samples of the cheese that participants would make, and Kimberly took home a batch that will be ready to eat by September. On Saturday morning, they drove to Laceyville, from which they were shuttled up river by Endless Mountain Outfitters of Sugar Run for a float back to Laceyville where the Wyoming County borough’s annual Community Day was underway. In the course of the day, the family met EMVB Executive Director Jean Ruhf at Grovedale Winery and River Barge Brewery in Wyalusing, where Kristaffer enjoyed sampling. Later on Saturday, they returned to the Dushore area to see the Artisan Alpacas farm, where a new baby – named Taz – was the star of the show. “Taz was running around and was so cute,” Kimberly noted. The family was shown how fleeces are cleaned and prepared, and they purchased souvenirs at the shop, including an alpaca wool finger puppet of a parrot for Elijah. On Sunday morning, Kimberly, Kristaffer, and Elijah drove to the Endless Mountains Nature Center at Vosburg Neck in Wyoming County, where they met up with Executive Director Rebecca Lesko, who took them on a walk to look for birds that were currently nesting and breeding in the area. “I got some really nice pictures of the eagles nest and the adult eagles, and we saw (remnants of) the canals,” Kimberly recalled. Kristaffer was not so much into birding, so he played a game of disc golf on the course nearby at Camp Lackawanna. The dining experiences the family shared were among their most memorable moments and started with breakfast each morning at the Harrington. Eating at the Strawberry was also a unique experience for the family “We got to see baby goats, and my grandson played with the rabbits. There was an astounding view down into the valleys,” said Kimberly. At the Crestmont, the family enjoyed salmon and pasta on an outside deck near a large fireplace. Elijah and his father played shuffleboard and discovered an old cistern on the grounds. Twigs, on the other hand, provided a downtown dining experience that left a lasting impression on Kimberly. “I love the lamps that look like Bluebells, and the food was phenomenal,” she remarked. EMVB picked up the tab for the whole trip as part of the promotion. As was anticipated when the contest was devised, Kimberly and her family thoroughly enjoyed their stay in the Endless Mountains and look forward to returning to the region to experience more of what Bradford, Sullivan, Susquehanna, and Wyoming counties have to offer. EMVB invites interested readers to create their own adventures in the Endless Mountains by logging on to www.endlessmountains.org for more information on many fairs, carnivals, festivals, and ongoing exhibits slated in the region between now and fall. 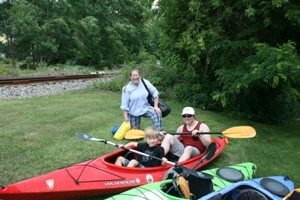 Kristaffer and Elijah try out a tandem kayak at Endless Mountain Outfitters as part of the Create Your Own Adventure Sweepstakes winners. 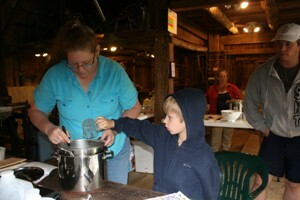 Kimberly and grandson, Elijah, make a batch of cheese at the Tool and Textile Museum in Orwell.